Think kids move slowly when asked to clean their rooms? They probably look like Usain Bolt next to these robots. On Monday, Tokyo-based robotics company Preferred Networks showed off a pair of fully autonomous room-tidying robots at CEATEC 2018, a Japanese tech exhibition. And while they are a huge technical step up from the dust-guzzling Roomba, they sure take their time. 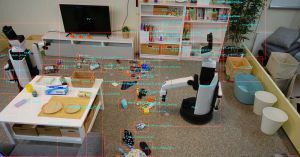 In a video of the demonstration, the robots navigate a room in which various objects — shoes, toys, plasticware — litter the floor. The robots pick up the objects one by one and put them where they’re supposed to go, expertly dropping a piece of plastic into a bin and placing a shoe neatly on the floor next to its match. According to a site describing the robots, this is all possible thanks to a combination of cameras and deep learning software, which allow the tidying robots to identify objects and decide their fate. Presumably, users would need to train the bots in some way so they’d know in advance where to place each object. Occasionally, one of the bots drops an object outside a bin, or knocks askew a box of folders while placing an object on a shelf. But in general, the robots seem to know what they’re doing, and they do it with relative skill. What they don’t seems to know how to do, however, is anything fast — the video is sped up to 20 times actual speed, and the tidying robots still don’t exactly zip around the screen. According to a Wall Street Journal report, Preferred Networks hopes to sell its room-cleaning robots, but it doesn’t say when. Until it can teach them to pick up the pace, we’re probably better off just tackling our tidying tasks on our own. Sorry, kids.